Said to be the second widest-rimmed volcano in the world, the unassuming Poas volcano in Costa Rica has erupted a number of times since seismic activity was first recorded there in 1828. Poas is famous for phreatic eruptions, which are a result of groundwater expanding and becoming steam. Poas has frequent eruptions of varying magnitudes. The last major eruptions occurred in 1952-54, with the most significant recent eruption in 1994; that included explosive eruptions in the central vent and the crater lake and phreatic explosions. The '94 eruption caused damage to land and property. A similar but less powerful large eruption occurred in 2008, and that one caused evacuations. Geysers in the Poas volcano crater can spew up to 590 feet, making this the site of some of the highest geysers in the world. On Jan. 25, 1971, the government of Costa Rica established a national park protecting the cloud forest and other ecosystems surrounding the Poas volcano. More than 79 species of birds have been spotted in Poas Volcano National Park and, while many species are less common at these high altitudes, there have been reports of squirrels, rabbits, coyotes, frogs, and snakes. Other important plant life includes ferns, poor man’s umbrellas, and epiphytes. The park now covers 16,000 acres. 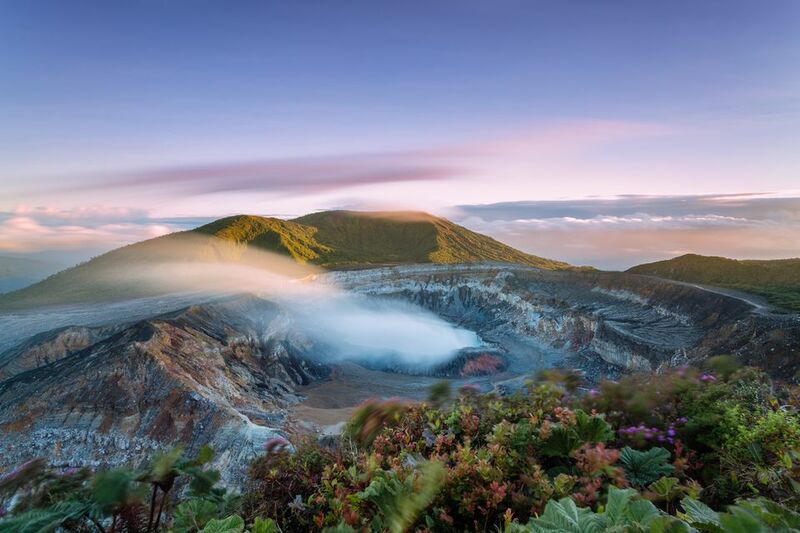 The Poas volcano reaches more than 8,700 feet above sea level, and its crater measures more than a mile across. There are several short trails at the summit leading to the main crater and the crater lake. The trails can be muddy so it’s important to bring sturdy, closed-toed shoes and dress in layers for varying mountain temperatures. There is also a visitor’s center on top, which houses a number of interactive exhibits, a cafe and gift shop. Try to get there as early in the day as possible because clouds can set in as early as 10 a.m., obstructing any view of the rim. You can get there by car by heading first to Alajuela and then Fraijanes. There should be signs for Volcan Poas as early as Alajuela. There is a paved road to the park entrance, after which you’ll have to walk 20 minutes to the rim. Public transportation leaves from the Alajuela bus station in San Jose, which is on Avenue 2 between calles (streets) 12 and 14. The bus leaves at 8:30 a.m. and returns at 2:30 p.m. Get to the bus station early because some bus drivers take off a few minutes before the scheduled departure. Tour companies offering trips to Poas include Costa Rica Expeditions and Swiss Travel Service. You can book half- or full-day trips, which can be combined with other sightseeing activities. A visit to Poas can easily be combined with a trip to La Paz Waterfall Gardens, a rescue wildlife preserve, and a popular ecological attraction.